Heads up audiophiles and JBL fans from the south. 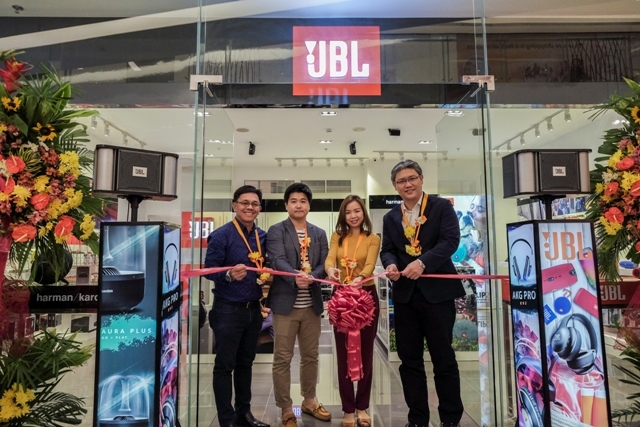 Beyond Innovations, the official JBL distributor in the Philippines, opens new JBL Concept Store in Festival Mall last December 16, Friday. 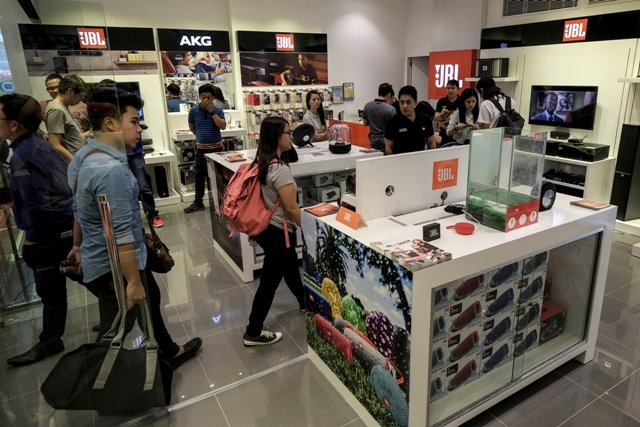 In line with Beyond Innovations Inc. 16th year in the business(almost two decades) opens the doors to the first official JBL Store in the south of Manila, Philippines, strategically located in Festival Mall with the official grand opening on December 16, 2016. Attendees are treated to exclusive opening day deals, raffle prizes and a week-long Time Sale of selected products. This event, attended by HARMAN and Beyond Innovations executives, dealers and select members of the press, was also graced by guests from Harman APAC region. 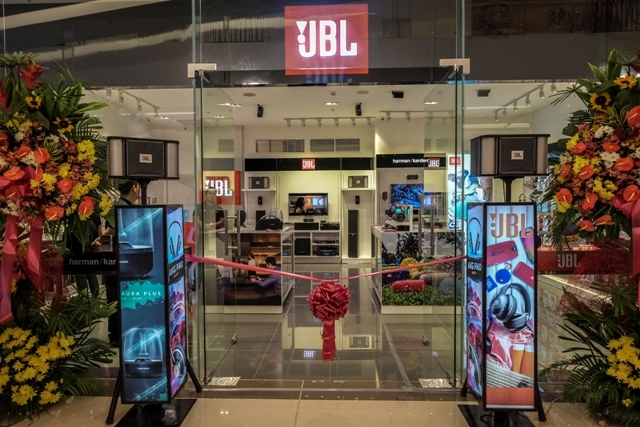 Located at the Upper Ground Floor, New Wing, JBL Festival Mall transforms how consumers interact with audio products and experience sound by giving them improved access to HARMAN’s award-winning products from legendary brands such as JBL, harman/kardon and AKG. 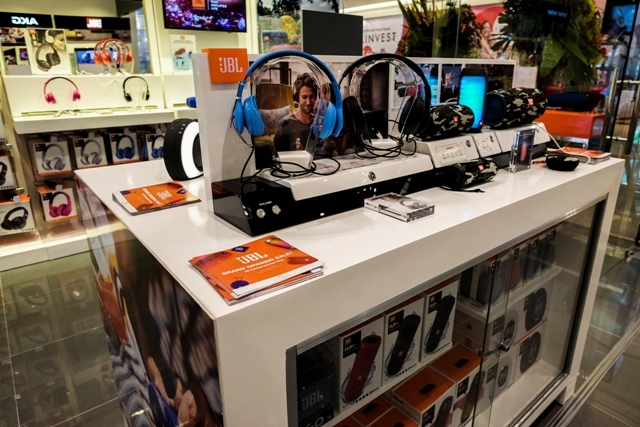 JBL Festival Mall features award-winning products from HARMAN’s brands, including home audio products, high-performance loudspeakers and headphones for everyone from sound aficionados and tech gurus to music lovers and style seekers. Upon entering the store, consumers are greeted by displays of home theater speakers and soundbars. The 5.1 Home Theater speaker system is readily available for testing, either for playing movies or music. For a more intimate and immersive experience, home-theater products can also be experienced at the improved Home Theater room which boasts of a projector for better and larger viewing. The Home Theater room will help shoppers get a sense of how quality audio truly sounds so that they can have the richest music or movie watching experience possible. 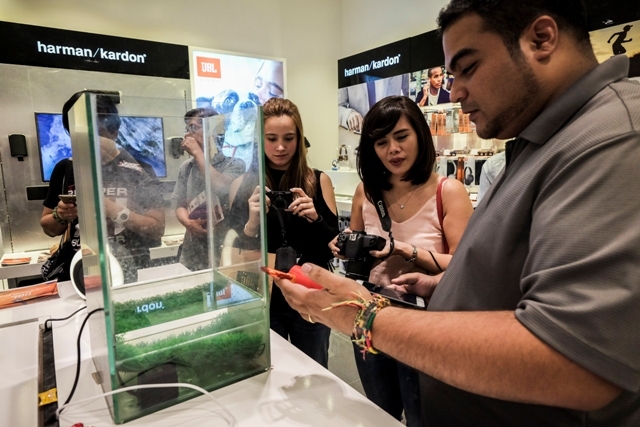 For those seeking portable music solutions, headphones and portable speakers are displayed in more interactive modules at the right side of the store. 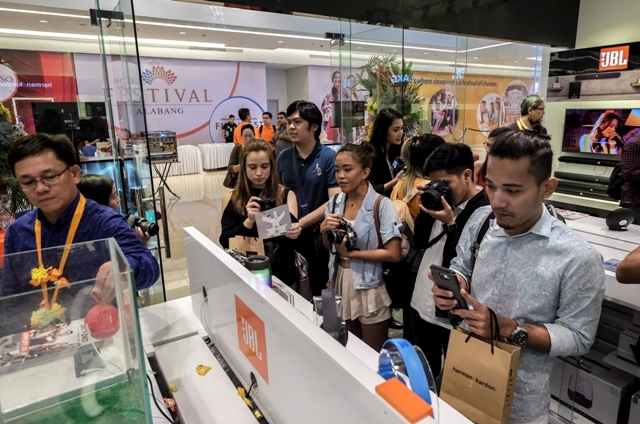 This section of JBL Festival Mall features modules with TVs showing slideshows and videos of the newest products boasting this experience area. It is a portable, compact waterproof stereo speaker with room-filling sound and a battery with capacity enough to power your lifestyle—however active it may be. Allowing you to listen wirelessly and charge endlessly in rain or shine, its 6,000 mAh lithium-ion battery keeps the music going for a full 12 hours, with power to spare for charging phones, tablets and other devices through its USB port to ensure that you are never left hanging without your tunes or mobile device while on any expedition. Also launched LIMITED EDITION of Charge 3 SQUAD. JBL’s newest soundbar works seamlessly with 4K displays and features extraordinary JBL audio performance. The JBL Cinema SB450 fills any room with theatre-quality sound and music using HARMAN Display Surround sound and Dolby Digital decoding. Whether binge-watching the latest must-see shows or cheering along to live sports, the JBL Cinema SB450 provides powerful bass with its wireless 8-inch 200W wireless subwoofer. Movie lovers can enjoy clean dialogue and voice enhancements for crisp, clear sound during films without having to adjust volume. Further, JBL enthusiasts can amplify their listening experience with JBL Connect: users can stream Bluetooth audio to the SB450 and other JBL Connect-enabled speakers at the same time by connecting JBL Connect-enabled speakers to their SB450. Multiple devices can connect to the soundbar through three HDMI inputs, while one HDMI output (ARC) seamlessly connects to the TV. When also connected to Bluetooth-enabled devices, movie and music lovers can automatically switch between television audio and a phone or tablet audio using JBL SoundShift™. The JBL Cinema SB450 is sleek, simple, and easy to use. Its understated look and feel allows for the soundbar and subwoofer to tastefully blend into any existing home theatre. With the TV remote control learning feature, users are able to program the soundbar to accept signals from their existing TV remote, eliminating the need for multiple controllers. The new Harman Kardon® Onyx Studio™ 3 combines award winning design language with a beautiful balanced form blended with an amazing audio performance delivering authentic, room-sized sound from any compatible hand-held device. The compact, free-standing speaker system incorporates two woofers, two tweeters, and two passive radiator cones for rich and realistic four-channel sound. The unit connects wirelessly to any Bluetooth® enabled hand-held device and has a rechargeable lithium ion battery that allows for up to five hours of playing time. Designed with travel in mind, the Bluetooth® headset embodies sleek, head-turning visual and touch appeal, with premium-stitched leather and a stainless steel body and sliders. Ear-cup-mounted touch-sensitive controls are at your fingertips, providing instant access to remote functions — the ultimate in simplified control and total convenience. Truly wireless, these headphones combine the connective ease of Bluetooth® technology and NFC for maximum pairing from a wide spectrum of smart devices. The Harman Kardon Sabre SB 35 soundbar redefines what a home entertainment system should be in a modern form, function and design. With an ultra-thin, 1.25”, aluminum-finished soundbar and its ultra compact companion – a wireless, powered subwoofer – the Sabre makes bulky audio equipment look and sound passé. With custom developed Harman Kardon drivers tuned to perfection and maximum processing power for the latest audio technologies, the Harman Kardon Sabre SB 35 doesn’t just look the part – it sounds it as well.